NEW YORK, NY, August 17, 2018 — With over 200+ registrants to date, the fifth annual Bike East has more than quadrupled participation for the 20-mile community bike tour and festival since its inception. This Saturday, residents of East New York, Brownsville and central Brooklyn neighbors will take to the streets for a full day of free fitness activities for cyclists and non-cyclists alike, including a supported bike tour, kids bike riding class, boxing, zumba, dance classes, health vendor marketplace and more. Early attendees will have an opportunity to score a free bike helmet in the helmet giveaway and biking newbies can join the adult or youth learn-to-ride classes courtesy of Bike New York. Kids can also participate in the bike swap or win a bike, courtesy of the Recycle-A-Bicycle bike giveaway. The bike tour route for this community event will ride through East New York and Brownsville as a large group, cover some parts of Howard Beach, Canarsie Park and Flatlands with stops in the Jamaica Bay to introduce riders to new access points on the Jamaica Bay Greenway. Bike tour participants will have access to snacks to refuel at stop points along the route. Plus, the grand finale celebration will culminate with a finish line concert by Brooklyn's own, The Experi3nce. Bike East was developed by Purelements: An Evolution in Dance's Co-founder, Kevin Joseph, to disrupt the negative narratives of East New York and Brownsville, more commonly known for high crime and lifestyle-related disease, like heart disease and diabetes, and instead promote health and community as an asset to members of the East Brooklyn communities and beyond. The concept of Bike East for these neighborhoods in particular are based on three pillars of impact: Community empowerment (people working together on common challenges); cycling advocacy (introducing cycling as a recreation, a commuting option and/or as a sport); and Healthy lifestyle (health is a basic necessity in order to progress in life). The annual event is issued with the goal of encouraging unity through biking and introducing residents of the East Brooklyn community to the active lifestyle amenities near them in hopes that they will choose to invest in their health, support local organizations and travel these routes again. Advanced registration for the bike tour is currently open at BikeEast.org. Check-in will begin at 8:30am and walk-in registration will be open until 9:45am. The bike tour will depart from Linden/Gershwin Park, located at Vermont Street between Linden Boulevard and Stanley Avenue at 10am and has an estimated return time of 2pm. The active lifestyle fair will begin at 10am. To volunteer or to RSVP for the active lifestyle classes, visit BikeEast.org/events. Registration for the tour and the active lifestyle events are FREE and open to the general public of all ages. 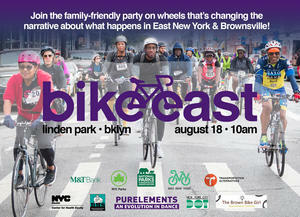 The 2018 Bike East event is presented by Purelements: An Evolution in Dance and The Brown Bike Girl and is sponsored by the New York City Health Department Center for Health Equity, M & T Bank, the Brownsville Multi-Service Family Health Center, Brooklyn Arts Council and the Rogosin Institute and Central Brooklyn Health Movement. Partners include National Park Service, New York City Department of Transportation, New York City Parks and Recreation and Bike New York. Jamaica Bay Wildlife Refuge Visitors Center will serve as the rest stop on the route. For press inquiries on Purelements' Bike East 2018, please contact Jasu Sims at [email protected]. For press assets, visit bit.ly/BikeEast2018. To connect with Purelements, follow the company on Facebook, Twitter and on Instagram @Purelements. To learn more about Bike East 2018, visit BikeEast.org. Purelements: an Evolution in Dance (“PE”) is a 501(c) (3) performing arts organization founded in 2006, by Kevin A. Joseph and Lakai Worrell. The mission of PE is to use multiple facets of the performing arts as educational tools to evolve and transform the individuals and communities it serves, and to present dynamic performances that are socially relevant and impactful. PE's mission unfolds through an art-in-education program, a performing arts program and its professional and pre-professional dance companies. To learn more about Purelements, visit purelements.org.